Learn to create and use recessed graphics to add a sense of depth with this advanced tutorial for Adobe Illustrator artists. Choose a thick weighted font that will create a better view into the recessed area. Select the type and go to 3D > Extrude and Bevel. Enter the rotations highlighted below. For the Extrude depth ensure your number is fairly large so the depth of the letters is dramatic. Enter 1 for Blend Steps. This will make it easy to select the surfaces once we apply the effect. Adjust the light source on the sphere so each side of the letters is lit differently. This will allow you to more easily see what area you're selecting. Last, check the box Draw Hidden Faces, which essentially creates the recessed type effect. Select the type and go to Object > Expand Appearance. After that ungroup the object until you can no longer ungroup it (this usually takes about 4 un-groupings). Select the face of the letters and place them on a new layer and turn that layer off for now. Note: do not move the letters up, I just did that to show you what you should be selecting. As you can see, the insides of the letter have all their faces drawn once you can see what's underneath them. On occasion there may be a part of a letter that does not automatically get rendered. This is the case here, where I've drawn a red shape behind the "C" to highlight this instance. If this occurs, simply adjust the lighting (as in Step 2) when you apply the 3D effect to the letters. Of course this will require undoing a small amount of work, but it should be fairly simple. Once all the inside faces of the letters have rendered properly continue on to the next step. I've selected two inside faces of the "R" that I will merge together in the Pathfinder. Any of the inside faces of the letters which have a separation need to be merged together. This generally only happens when a letter has a curved edge. To merge the two shapes select them and in the Pathfinder, click on Add to Shape Area, followed by clicking Expand. Observe how both of the inside faces of the rounded part of the "R" are now one shape. Again, repeat this process on any other areas or letters where this is the case. The counter (inside area) of the "R" requires the same treatment. The "R" is all finished. Feel free to use whatever color you want to create a separation between the many surfaces of the letters. We'll be giving them a brown gradient in another step anyway. This is what all the letters look like when they have all their inside faces merged. There shouldn't be too much work to complete this phase, as long as the word you've typed (or the font you choose) doesn't have a lot of curved shapes. 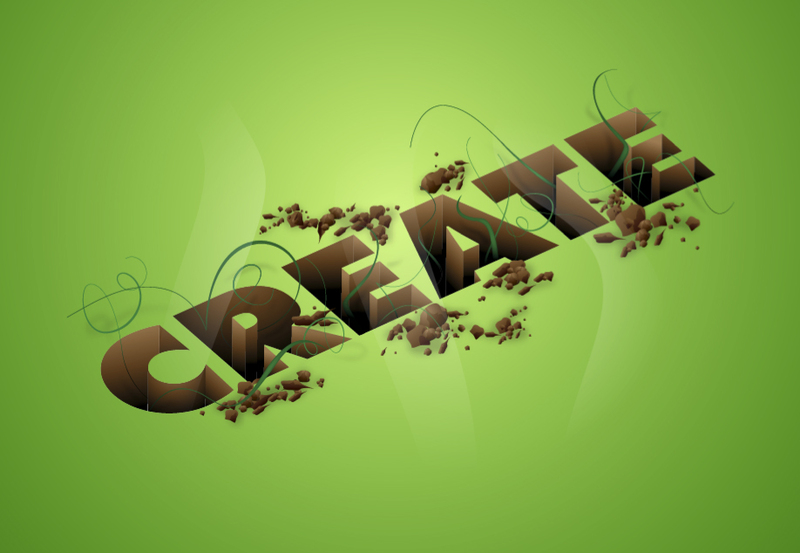 Turn the other layer on that has the top face of the word on it. On this layer draw a rectangle using the Rectangle Tool (M). Put the rectangle behind the word. Select all the letters only and merge them into one shape using the Pathfinder. After that select the letter shape and rectangle and in the Pathfinder, then click Subtract from Shape Area followed by clicking Expand, as highlighted below. You'll be left with a gray rectangle with the shape of the letters removed from the center. The recessed effect is now very obvious. Give the rectangle a green to light green gradient to simulate grass. Pick a rich brown color and use complete black for the other color. Start applying gradients to the inside faces of each letter. If the letter has a curved area, then consider using a radial gradient instead of a linear one. You should have a general idea of where you want your light source to come from so the inside of the letters look more realistic and consistent. Continue applying gradients to the rest of the letters. Here's what your illustration should look like right now. We'll add some rocks to the design to give it more appeal. Use the Pencil Tool (N) to draw arbitrary rock shapes. Tip: Hold down the Option key when you want to close the shape while you're drawing it, as it may sometimes be difficult to close a shape that's being drawn with the Pencil Tool. Overlap another random shape to create a shaded area on the rock. Use the Pathfinder to get rid of the shape outside of the rock that you don't need. To do this select both shapes, then click Divide in the Pathfinder, and ungroup the shapes after that. Give the areas of the rock a gradient to add more dimension to it. Create a range of rock shapes and sizes. Notice that the rocks that are farther away start getting smaller. Try to create a pleasing pattern or flow of rocks, rather than placing one or two rocks haphazardly. Place other groups of rocks in a few more places. You can rotate the rocks to vary their look. Use the Pencil Tool to draw a rough shape around each cluster of rocks. Set the Transparency to Multiply and adjust the Opacity to about 25%. Go to Effect > Blur > Gaussian Blur and enter a value that looks good to you. Repeat this process for the other areas of rocks. Using the Pen Tool (P), draw some elegant vine shapes that will complement the rigidity of the recessed type. It's difficult to get the shapes to flow smoothly, but with enough practice you'll get the hang of it! Make random shapes off to the side of the illustration, or draw them right over where they will ultimately go. You don't have to draw too many shapes to get a range of looks. You can rotate and trim, or mask the same shape to make it look entirely different. Place the vine shapes over the different letter in interesting ways. Give them a green to black gradient, where the black area is toward the opening of the letter. Vary the scale of the vines so they all won't look thin. You want some vines to stand out, while other just help balance the design. Pay close attention to how you treat the vines near the edge of the letters. Make sure they look as if they're going into the letter, as opposed to overlapping the edge in a careless manner. Give the vines shadows by drawing similar vine shapes and giving them a black to white gradient whose Transparency is set to Multiply and whose Opacity is at about 75%. Blur the shadow by going to Effect > Blur > Gaussian Blur. Last we'll add a unique atmosphere effect by using a random wispy shape as shown below. In the Transparency Palette set the Opacity to about 40%. Give the shape a black to white radial gradient and set the Transparency mode to Screen. When you draw the gradient on the shape make sure your center point of the gradient is NOT on the shape, as that would create a very harsh white area. The look we're after is much more subtle. Add a couple more of these areas and you'll be all set. Here's the final image. You've just learned how to create a recessed type design!